How do I Install the Albacross Tracking Code on My Wix Site? In order to install the Albacross code on your Wix website, you will have to use Wix’s App Market to add an HTML widget to your webpage. 1 Log into your Wix account. 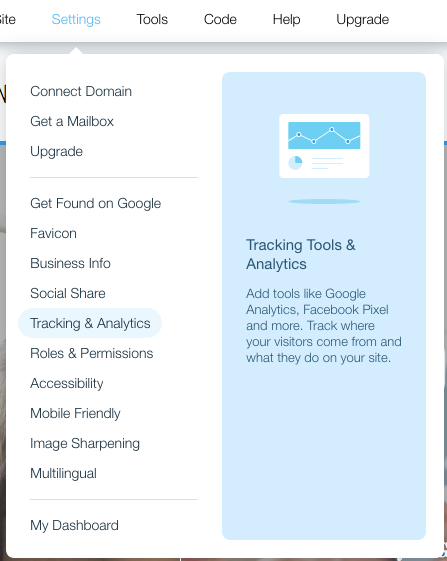 2 Click on Settings and then Tracking & Analytics (see image). 3 Click on New Tool. 5 Paste the script (that you find in your Albacross account) into the box titled ‘Paste the code snippet here’. 6 Then give the Custom Code a name (e.g. albacrossTracking). 7 In the section ‘Add Code to Pages’ select ‘Load code on each new page’ from the dropdown within the ‘All pages’ part. 9 Then click on Apply.